Life is motion. Moving every day is crucially important to your overall health and wellness. Everything from cardiovascular disease to depression has been tied to a lack of physical activity. This isn’t something that only adults need to be aware of. Getting enough physical activity as a child is an important step in reducing the risk of chronic disease in adulthood. When people work together as a team towards a common goal, each individual member is able to focus on their strengths. Great communication is perhaps the most important hallmark of a great team. High-level communication is the key that allows everyone to bring their specific skills and talents together to achieve more than they ever could alone. 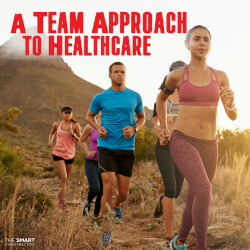 Great teams also exist outside of sports and business…have you thought about your healthcare team lately?